Ana Mardoll's Ramblings: Author Interview: Jed Fisher on "First Enlistment"
Author Interview: Jed Fisher on "First Enlistment"
Ana: Today we have Jed Fisher introducing his novel, "First Enlistment, War for Profit Part One". I haven't read this book myself, but Jed was kind enough to agree to guest blog about his book to any readers who might be interested in the subject. Jed, how would you describe your novel to your prospective readers? In broad terms, what is your novel about? 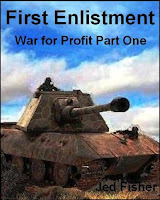 Jed: "First Enlistment: War for Profit Part One" is the first novel of the War for Profit Trilogy. The main character, Galen, has just graduated from a military academy. He begins his military career by enlisting in a professional mercenary armored brigade along with his two friends, Tad and Spike. Set a couple thousand years from now, professional mercenary units range in size from teams of four to entire divisions of fifteen thousand and offer their services, for the right price, to employers. Galen has enlisted in a mercenary armored brigade to seek his fortune and make his mother proud. Jed: The primary theme is military service. Although I’ve chosen to create a future setting for the action, the challenges of professional military service, the experience of fighting battles and wars, has changed little for the individual soldier, whether they poke one another with pointy sticks or vaporize one another with particle cannons. Jed: After having been asked, “What’s it like?” one time too may, I decided to write a book about military service. Of course it is a work of fiction, of science fiction, to avoid giving away any state secrets or divulging too much about current weapons capability or operationally sensitive information. But still, I give a clear sense of what it was like for me. But keep in mind, as with any experience, no two people experience it exactly the same way. As a fan of David Drake’s "Hammer’s Slammers" novels and short stories, I do appreciate his stories and the sense of ‘being there’ that he gives. And it’s close, so very close, to my own experience. I also enjoyed the entire line of Mechwarrior novels, as well as Harold Coyle’s Team Yankee novel. But my greatest inspiration for my novel was my own experience, 24 years in the US Army Field Artillery. Jed: Well, I could say many fans of "Hammer’s Slammers" would like "First Enlistment". But some won’t. Readers of Military Science Fiction are very diverse and have very specific taste. My experience in the military was from a very unique perspective, my own perspective, and won’t resonate well with some readers. Which is fine, I understand that. I can say that if they like the first chapter they will enjoy the rest of it. Jed: I’ve published a trilogy and "First Enlistment" is the first part. However, all thee novels do stand alone as separate stories. They do not end with cliff hangers. I have also released the entire trilogy in a single volume for readers who enjoy longer works. I have also published my short story collection, "River Rats and Other Stories", chosen from literary material I wrote for professional writing workshops and classes. What I’m working on now is a novella about a disgruntled Staff Sergeant left behind by his artillery unit at the end of large-scale combat operations to be a casualty replacement. So far I’m having a lot of fun with that story, set about two months into the beginning of Operation Enduring Freedom. Jed: My novel is available as an eBook on Amazon. I’m also on Facebook. And I have a Hubpages blog where I post articles, where readers can leave comments. Ana: Thank you, Jed. I understand you have the first chapter of your novel available as an excerpt for interested readers? And is there anything else you wish to add for our readers? Jed: Yes. Enjoy the sample. Galen would be a mercenary, as soon as he signed his first contract. He wanted to be successful enough to make his mother proud. She raised him and paid his way through the Ostwind Military Academy as she worked as a barmaid at the warrior base on Ostreich. Galen didn’t know his deceased father, but knew he had been a mercenary in the Foreign Corps; that’s why Galen was seven feet tall. His mother, she raised Galen to be a mighty and successful warrior. Galen had just graduated from the Ostwind Military Academy Armor School, and it was time for him to do his part. Galen sat at the bench on the sidewalk, hunched over, staring at his size fourteen combat boots and rubbed his large hands over his close-cropped brown hair. The mild headache was a reminder of last night’s graduation party. He stood to his full height, stretched, buttoned his grey full-length wool coat, stuffed his hands into his pockets--he could do that now, outside the Academy--and started walking toward the largest building in the city. It was where he would meet two of his academy classmates, to join the same unit with them. Galen stopped fifty meters away from the steps of the building and scanned the three dozen or so groups of job-seeking warriors. When he picked out his two friends, he stood watching them for a minute. Tad was almost two meters tall, of average build but not to be ignored. His scalp showed through his close-cropped academy haircut and added a slight touch of pink to his bright orange hair. He wore a rescue-yellow windbreaker and green-blue plaid parachute pants and gestured vigorously as he spoke to Spike. Spike seemed to be leaning on something invisible, standing in his knee-high leather boots, dark blue pants tucked into them, his hands stuffed into the pockets of his black leather waist-length jacket. His conservative haircut was probably the longest allowed by the academy, and his hair’s blackness was made even darker by styling spray. With his thick moustache, the short and stocky Spike resembled an ancient fighter pilot. “We have. The academy wouldn’t have listed them in our employment prospectus if they weren’t any good,” said Spike. “Hey, there’s that old man! He’s waving to us, wants us to come in!” said Tad. The three friends climbed the rest of the steps and entered the hiring hall through the door held open by the agent. He led them halfway down the hall, to an interior stairwell down three flights of steps and into a small, windowless office. The three warriors had to stand because there was only a desk, a computer terminal and a chair behind it. The portly old man, wearing a black business smock and soft-soled dress shoes, sank into the chair and pressed a key on the computer. As soon as a barely perceptible, but somewhat irritating, high-pitched noise filled the room he stood and extended a hand and a warm smile to the three friends. “Glad to be here,” said Galen. He had been drafted by Spike and Tad to do most of the talking. Spike grabbed Tad by the arm and pulled him back. Tad remembered his promise to keep his mouth shut and stepped back to lean against the wall with Spike. “Please, let’s skip anything that doesn’t include tanks,” said Galen. Burwell waited a full minute before speaking. He hit a few keys on the computer, it spat out three sheets of auto-copy paper, and he handed a sheet to each of them. The three young mercenaries scurried down the hallway, went up the steps two and three at a time, strode out of the office building and walked briskly to the spaceport. They were now officially members of a recognized and active mercenary unit, eager to get to their first duty station. They entered the spaceport, drawing icy and suspicious stares from the security guards. They seemed lost and had no luggage: obviously up to no good. “So where’s our gate?” asked Tad. “Simple. We’ll follow you,” said Galen. They walked about half a mile, the bustle of the main terminal dissipating into lonely walkways as they went. Soon they came to the automated monorail shuttle, dumped a coin into it and rode it to their destination. “Hurry guys, we only got twenty five minutes left,” said Galen. “I’m with you, brother,” said Tad. “Don’t worry, we’ll make it,” said Spike. They found their terminal and gate and dropped their boarding passes on the counter for a bored attendant to examine. “You got any luggage?” asked the thin man in his mid-thirties. “No,” said Galen, unable to take his eyes off the man’s bald spot. “So what do we do now?” asked Tad. “Go up two levels to the lounge, and keep a close eye on the monitor, to be sure you don’t miss your liftoff,” said the attendant, as though the question were directed at him. They took his advice. The lounge looked worn and overused, and there were no other customers. The smell of stale booze and long-dissipated smoke seemed to be a decade old, and probably was. The three mercenaries chose the corner booth nearest the bar. “We didn’t say we were going to the Jasmine Panzers,” said Galen, trying to preserve some semblance of operations security. They left twelve empty bottles and a reasonable tip when they went back down to their boarding gate. The balding attendant was talking with a loadmaster and a ship steward. They were welcoming civilian passengers and processing their paperwork when Galen and his two companions arrived. “Wait over there, gentlemen,” said the steward. They reached in their pockets and pulled out credit markers, academy graduate I.D.s and their mercenary contracts. The loadmaster read all the documents carefully and handed them back. “Do you think they wouldn’t call us ‘gentlemen’ if we weren’t academy graduates?” said Tad. “I guess so,” said Spike, strapping himself into the weapons control couch. “No, spacers hate mercenaries. That’s what my uncle told me. He used to work at this spaceport,” said Spike. “No wonder you found your way around here so well, it runs in your family,” said Tad. “Let’s drop it. I’m in no mood to fight,” said Galen. For him, discussions about family and lineage were taboo. But with a comfortably retired mother and a big chunk of money in his own account, his family heritage would be quite respectable. But not until then, not for a while longer. “So Spike, tell us more about this spacer/mercenary complex,” said Tad. “How long does this flight take?" “About six hours to the turnaround, where we coast for awhile, then maybe four hours as we decelerate to stop at the jump point.” Galen didn’t know, he was only guessing. The primary thrusters fired, gently lifting the drop ship into the air. “Hey, this ain’t so bad, can hardly feel the extra gravity,” said Tad. Although I’ve chosen to create a future setting for the action, the challenges of professional military service, the experience of fighting battles and wars, has changed little for the individual soldier, whether they poke one another with pointy sticks or vaporize one another with particle cannons. That's cool. I find contemporary war stuff reeeally triggery, so it's nice to have the same distillation in a setting that doesn't make me so antsy. The orthodontist Dr Joseph Bleakley was really nice and very gentle.